The Twins unveiled a $48.5 million renovation of their spring complex. A Hammond Stadium-record crowd of 8,547 was on hand for Saturday's exhibition win. 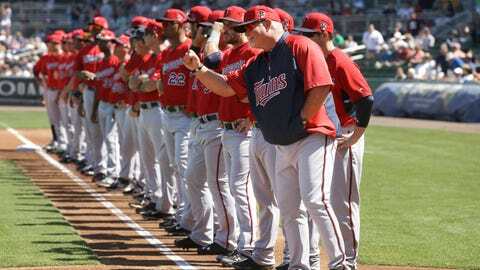 FORT MYERS, Fla. — Chris Parmelee’s three-run homer off left-handed reliever Jose Mijares broke open a close game in the sixth inning on Saturday, and the Minnesota Twins went on to beat the Boston Red Sox 6-2. Parmelee hit just .172 against lefties last year. He opened the season as the Twins’ everyday right fielder but gradually lost playing time until being sent back to Triple-A at the All-Star break. "I told him right before that, he stays in on lefties," Twins manager Ron Gardenhire said. "I don’t worry about him against lefties. When he’s swinging good, he hangs in there pretty decent." The former first-round draft pick is out of minor league options. The Twins unveiled a $48.5 million renovation of their spring complex. A Hammond Stadium-record crowd of 8,547 was on hand. Joe Mauer added a run-scoring single in the first for the Twins. He made his 2014 debut at first base after making the permanent move from catcher in the wake of a season-ending concussion last Aug. 19. Daniel Nava homered for Boston and Grady Sizemore added a hit. Left-hander Scott Diamond, in a seven-way competition for the final spot in a revamped rotation, had trouble with Nava (homer, four-pitch walk) but was solid otherwise in his two-inning spring debut. Diamond, who had trouble finishing off hitters last season, jumped ahead 0-2 on four batters and retired them all. "I’m happy with how it went," Diamond said, "but there’s definitely a lot of adjustments I need to make." Third-base prospect Miguel Sano will undergo Tommy John surgery after reinjuring his throwing elbow during Thursday’s intrasquad game. He will miss the entire 2014 season, the team announced.